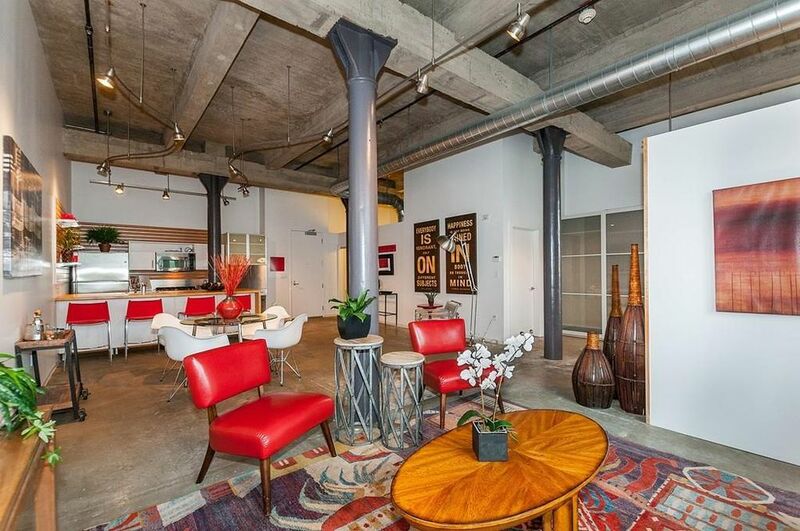 Boston Lofts presents a rare opportunity to own a beautiful penthouse loft in Boston's Seaport. 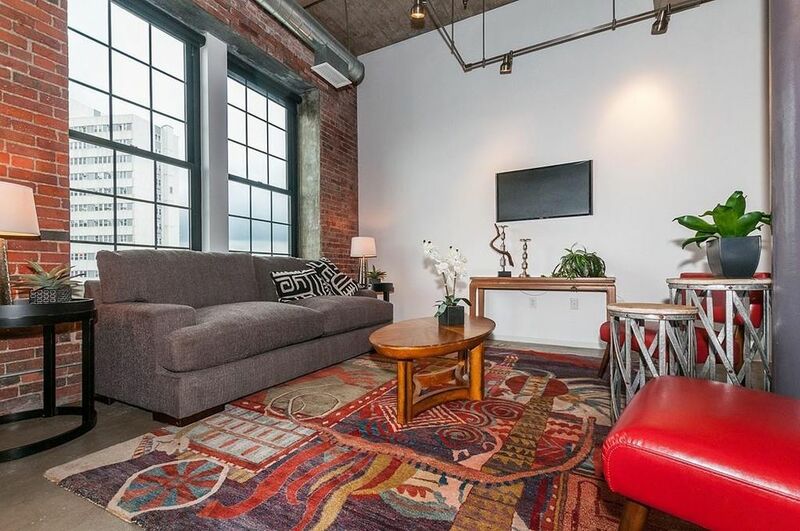 The lofts at 33 Sleeper Street are perfectly situated across from an open air lot with a 100 year city lease, providing the loft with unobstructed water views of the fort point channel and the city skyline. The interiors are just as impressive as the view, with an entire wall of red brick and exposed sand blasted wooden ceilings and beams. The combination of high ceilings and four skylights keep the space feeling very airy and open. The simple, rustic space provides opportunity for new owners to really add their own special touch. There is a custom platform with hardwood floors, built-in bookcases and more that add a clear definition and separation to the space. 33 Sleeper Street provides residents with plenty of amenities, including deeded courtyard parking just steps from the front door, deeded storage, extra bike storage, an in-unit washer and dryer, plenty of closet space, a doorman and new elevators. Across the 1,263 SF there is easy conversion potential for creating a second bedroom, giving this space a huge number of possibilities. 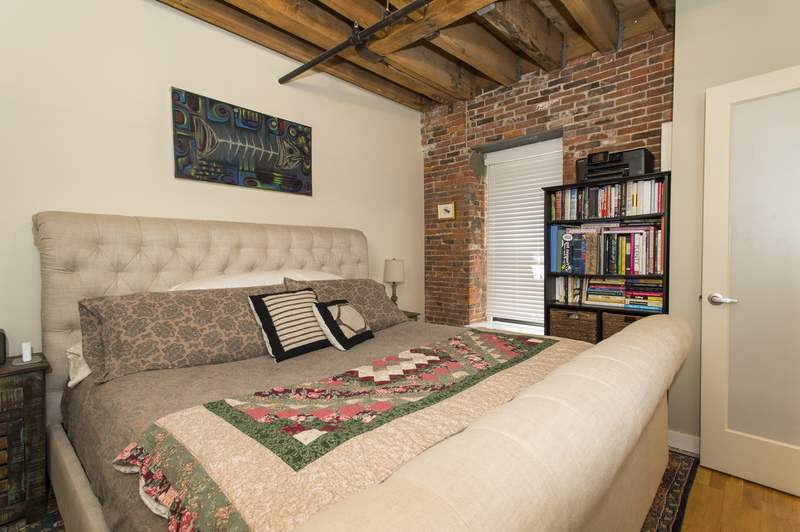 Located in the heart of Boston's newest restaurant row and just minutes from multiple transit lines, this loft is conveniently located for local amenities and traveling around the rest of Boston. Contact us to hear more details about this rare opportunity today! Broadluxe is a beautiful loft building located in the Financial District, boasting exposed brick, high-end amenities and interesting open layouts. The listing is located on 101 Broad Street and offers exposed brick walls, sandblasted wood ceiling, exposed beams, large windows and hardwood flooring throughout. The space has been finished with custom lighting, custom built ins, plenty of storage and a laundry in the unit. One of the most outstanding features is the beautifully renovated kitchen, with maple cabinets, stainless steel appliances, a glass backsplash, granite counters and a center island. One of the main custom features is a dividing wall between the living room and bedroom with frosted glass and a 55-inch television built in that can be rotated to face either room. Broadluxe offers residents a boutique building experience, with concierge services, professional management, an elevator, bike storage and additional storage. The building is conveniently located in the Financial District, just steps from the Greenway, Waterfront, Faneuil Hall, Seaport and the North End. View more information and full details of the property here. The American Brewery Lofts building is one of the most historic and beautiful breweries in the city, that is now converted into luxury lofts. Located at 251 Heath Street in Jamaica Plain, this building is a prime example of the reuse of historical space. Residents can benefit from high ceilings, up to 18 feet in some units, as well as exposed brick, exposed beams and natural elements tied in, making the history a focal point. The lofts are spacious and open plan, with wide windows providing plenty of natural light and a layout that is very customizable. The units are available for rent or sale and there are a range of unique spaces to choose from. View the interior of one of the available lofts below, thanks to boston.curbed.com. 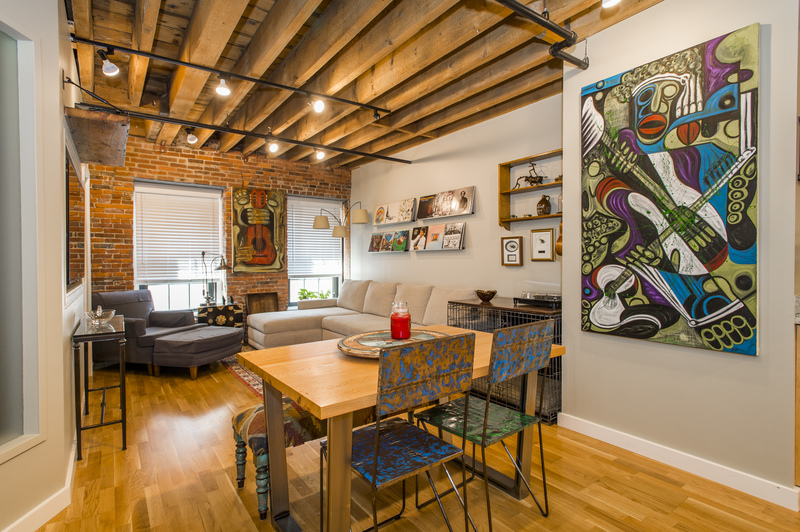 Contact us for more information about lofts around Boston and to find your new home today! 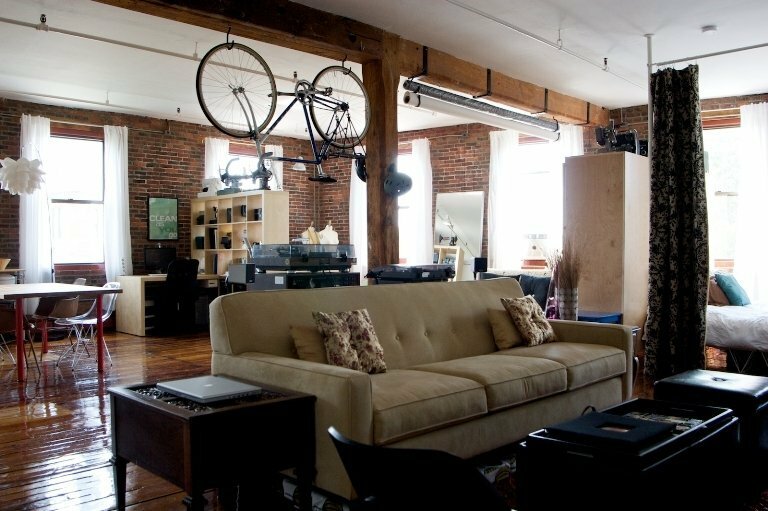 Lofts often come with a large amount of open space, which is beneficial while at the same time becoming a design challenge. In small, open spaces the most important objective is to create a functional area through design. 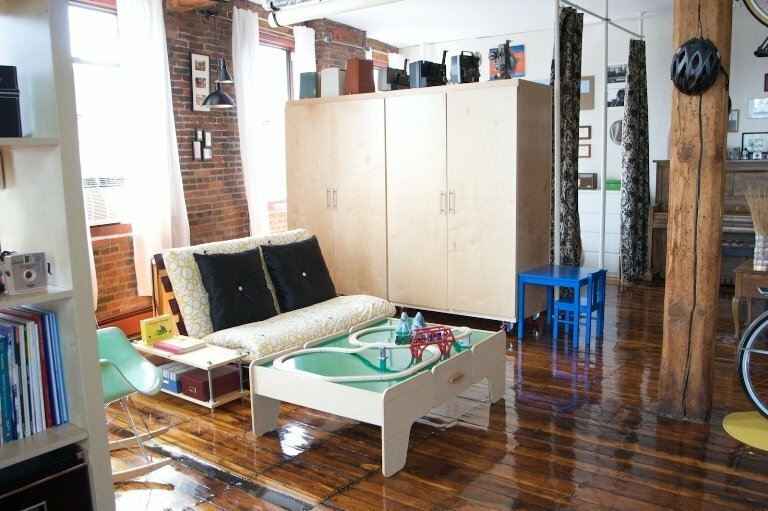 Here's how one family transformed their wide open South End loft into a functional family space with areas that suit all of their needs without separating the space too much, thanks to Apartment Therapy. In order to make sure their 1,095 square foot space had everything they needed, it was important to create defined spaces while preserving the openness. The family was able to do this and effectively created separate areas for a dining space, living room, kitchen, bedroom, play area and work area, without putting up walls or closing off any square feet. The result is a wide open space with clearly defined functions and no area left unused or wasted. The space is cozy without being cluttered and flows from one space to another easily. Millbrook Lofts is a beautiful new construction development in Somerville. These luxury loft apartments offer a mixture of modern design and a unique expression of history. 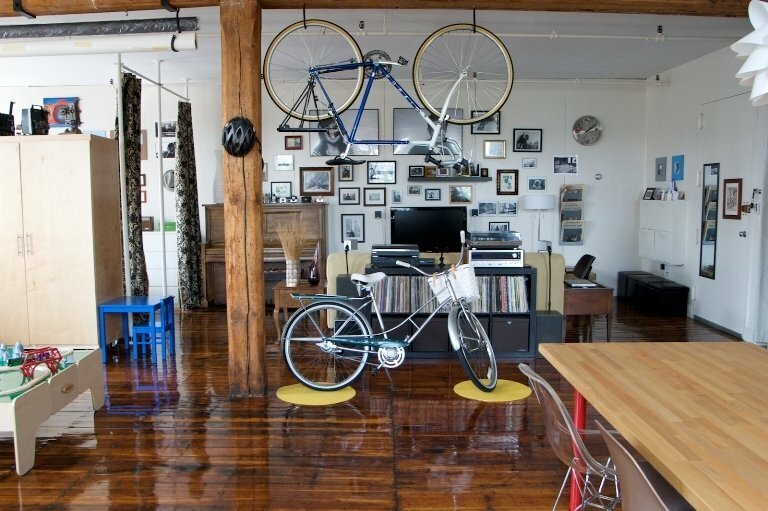 From studios to two bedrooms these distinctive apartments are creatively incorporated into a century-old cold storage building. 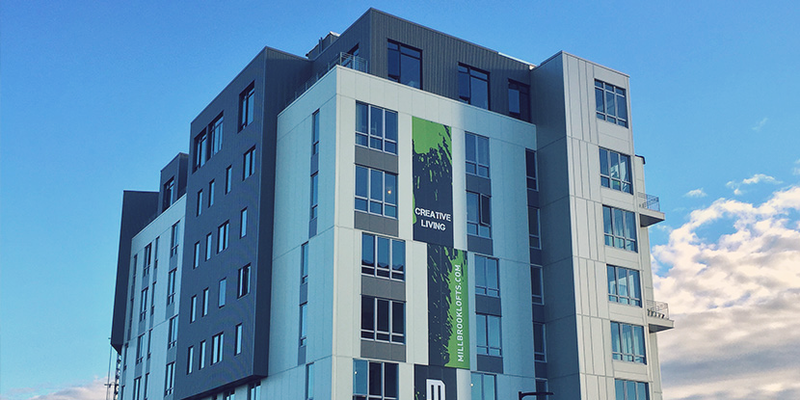 The Millbrook Lofts are conveniently located a quick walk from Cambridge and MBTA transportation stops. With a mall down the street and restaurants, bars and shopping steps away it is the perfect location in Somerville. The interiors include large windows offering great city views, modern interior finishes, open-style kitchens, big closet space and in some units private balconies and roof-top terraces. The building comes with beautiful amenities including a resident lounge, green space and a communal rooftop deck, perfect for the summer! Until 2014 this building was used as a cold storage warehouse, storing meats and vegetables that were delivered to local restaurants. It took months to defrost the whole building before it could be renovated into lofts. The 100-unit building is a truly unique and exciting place to call home! Contact us today for more information: bostonlofts@advisorsliving.com. 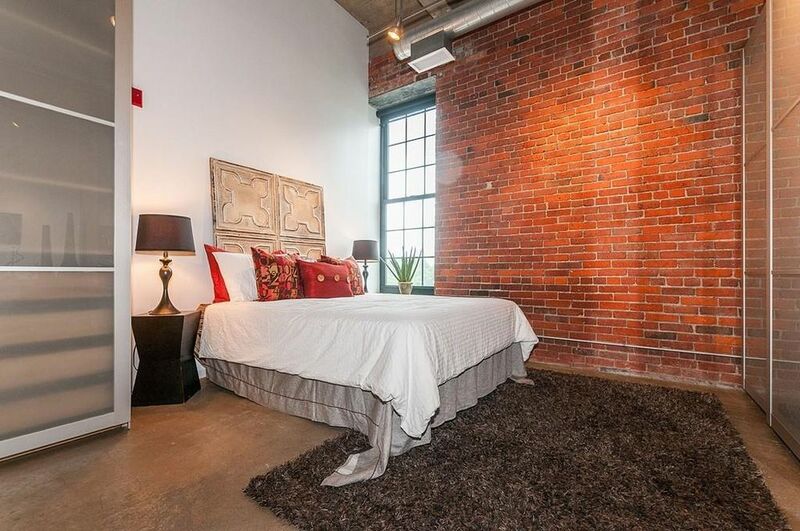 Laconia Loft East in the South End is a collection of beautiful luxury condos. With large open spaces, large windows, a roof deck and underground parking, the building offers resident a unique and exciting space in a desirable area. Each unit is a different size and price, ranging from one bedroom to three bedroom residences. 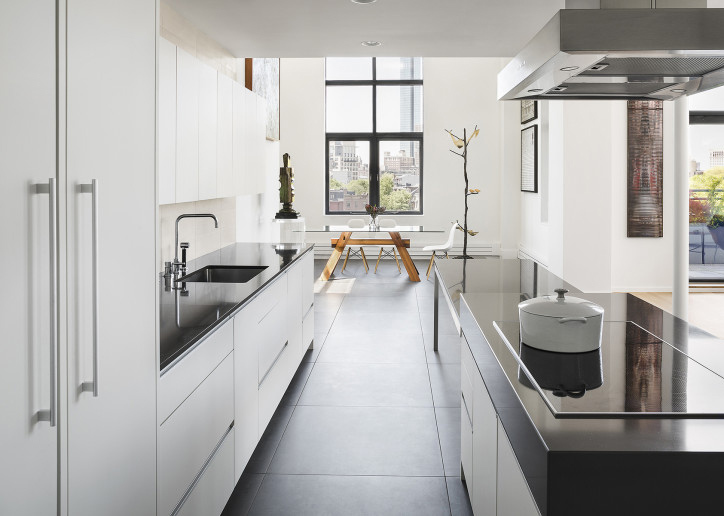 The penthouse loft was made even more unique by its beautiful, minimalist interior design by Hacin + Associates. 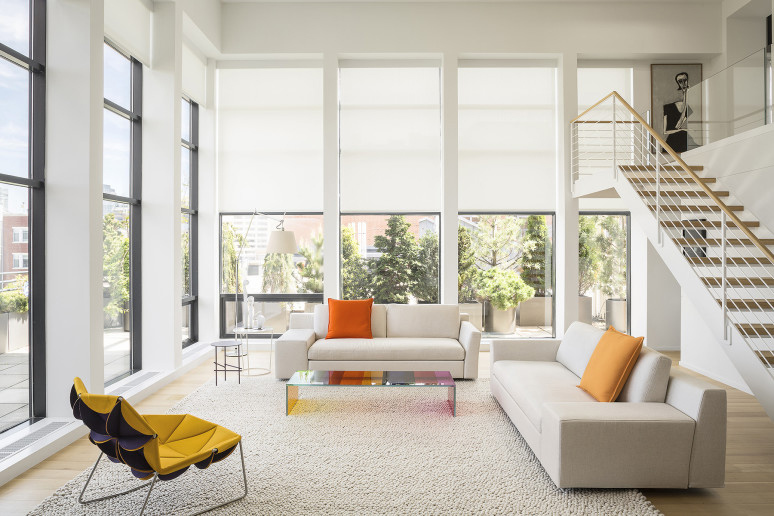 The focus of the space is on emphasizing a collection of contemporary art and the beautiful natural light and color that is incorporated throughout the loft. With a minimalist palette, the white walls and the natural wood floors allow the art pieces and pops of color on the furniture to really stand out. The huge windows frame the beautiful Boston skyline and stretch throughout each floor. Each room simply flows into one another and all include very clean lines. See more images of the interior design here. On the corner of Massachusetts Avenue and Newbury Street is 360 Newbury Street, a chic loft community. The building was originally designed by the world-famous architect Frank Gehry and historic touches remain along with the luxury, modern amenities. Each unit throughout the building has its own personality, complete with 12-foot ceilings and oversized windows offering abundant natural light, not to mention beautiful views of Back Bay. The chef's kitchens are finished with granite countertops and state-of-the-art appliances, while the all-marble finishes decorate the bathrooms. 360 Newbury Street's prominent location in Back Bay, minutes from the Prudential Center and shopping on Newbury Street, makes living there even more desireable. With the recent opening of a three-story TJ Maxx in the retail space of the building, residents can find everything they need right on their own doorstep. This premier loft building is a truly special find in Back Bay, with the opportunity to either buy or rent units. To find out more about 360 Newbury Street and other lofts around Boston contact us at bostonlofts@advisorsliving.com. Right in the middle of Fort Point and the Seaport is the new Watermark Seaport luxury building. The 17-story luxury tower offers contemporary apartments and a 65-unit loft building and perfectly combines the area's innovation and art origins. In the midst of two lively urban cores, the building is surrounded by a great selection of outdoor space, including: Seaport Square Green and Fan Pier Park, complete with a dog park, playground and basketball court. The lofts offer a unique space for residents and the building has over 15,000 square feet of amenities. With a rooftop sky deckm a second-floor terrace including fire pits and trees and a yoga studio and fitness center, the building has everything you'd expect from a luxury building in this area. As a special touch, the building is filled with commissioned work from indie artists around Fort Point. The ground floor will also soon be home to the first CVS in the Seaport. From studios to penthouses, prices range from $2,300 to over $7,000 a month. 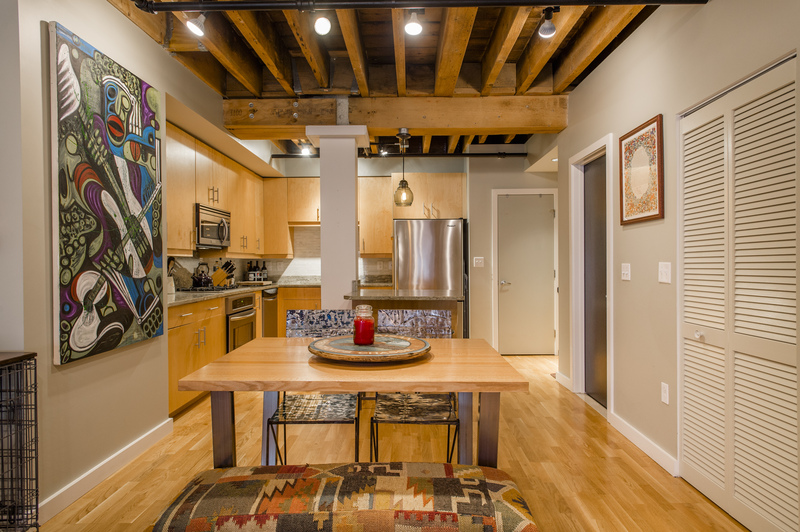 To find your perfect loft in Boston contact us at bostonlofts@advisorsliving.com. Development on the 10 Farnsworth Street luxury condo building in Fort Point will finally begin this June, with an expected completion date around October 2017. TCR Development and JB Ventures together have developed this project and were approved for construction in January 2014. Before construction commences pre-sales of the units are scheduled to begin, starting at $2.5 million. The building will house 9 luxury apartments and lofts, adding to the vibrant developing real estate within this area. The luxury amenities include: shared and private roof gardens, floor to ceiling windows, chef kitchens and spa-like bathrooms. With designs by CBT Architects, the six-story building combines modern luxuries with industrial design and all units will include the latest technology from heated floors to state-of-the-art audio, lighting and climate control. Retail space will occupy the group floor where Farnsworth and Congress intersect, although the occupants of that space are yet to be decided. To tour 10 Farnsworth Street and other luxury lofts in Boston contact us at bostonlofts@advisorsliving.com. The Baker Chocolate Factory has undergone 30 years of renovations to become a beautiful housing community in Dorchester. Previously being offered as rentals, the latest units within the complex are now completed and up for sale as of last month, with prices averaging in the low $500,000 range. The Water Mill Lofts are located in Dorchester in the Lower Mills area. They are situated right on the edge of the Neponset River, in what used to be the chocolate factory's boiler room. The units have maintained their industrial feel, with features including exposed beams, preserved historic features, metal staircases and piping. Gourmet kitchens, walk in closets, glass showers and other luxury amenities fill the 17 new units. With the upgrades, The Architectural Team have been sure to preserve the history and charm of the building's former sweet life. There are even reports that visitors and residents still occasionally get a whiff of chocolate, making these luxury lofts a really unique place to call home. To tour luxury lofts in Boston contact us at bostonlofts@advisorsliving.com.